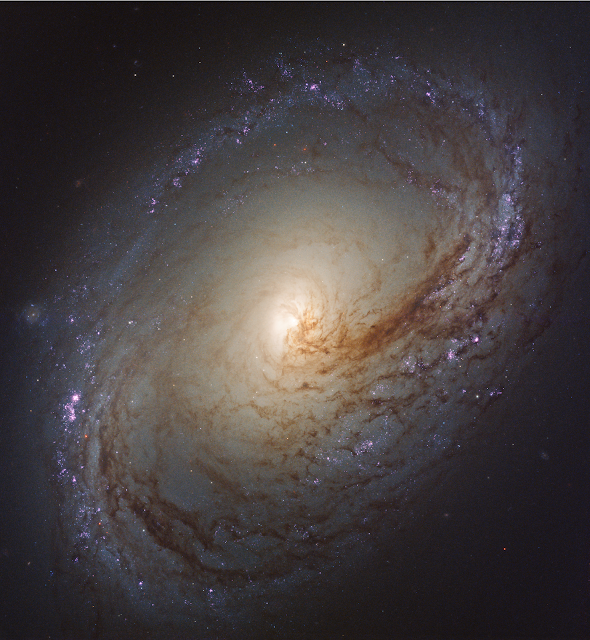 Messier 96, also known as NGC 3368, is a spiral galaxy about 35 million light-years away in the constellation of Leo (The Lion). It is of about the same mass and size as the Milky Way. It was first discovered by astronomer Pierre Méchain in 1781, and added to Charles Messier’s famous catalog of astronomical objects just four days later. A wave of star formation is occurring along the dark filaments that make up the spiral arms. The fledgling stars illuminate the surrounding hydrogen gas, making the stars appear pink. Star birth begins at the inner spiral arms and moves outward. The milky white regions in the center of these galaxies represent the glow of countless stars. An image of this galaxy was already released back in 2015. This newly-processed image now also shows ultraviolet radiation Hubble captured from the galaxy.